NBA Playoffs Preview: Who Can Shake up the Field? Russell Westbrook will likely be named NBA MVP, but can he carry his team past James Harden and the Rockets in the first round of the playoffs? It’s playoff time in the NBA. Many moons ago, this was a very exciting time for folks, even though this is a sport and a league dominated by teams with star players at their disposal. But lately, where have all the surprises been? You can set your watch to LeBron James playing in the NBA Finals, as he has done so six consecutive years. You can seemingly assume that the Western Conference will be represented by either the Golden State Warriors or San Antonio Spurs (likely the former). So in 2017, can any teams disrupt this pattern? The Boston Celtics grabbed the No. 1 seed, but that shouldn’t worry Cleveland Cavaliers fans. LeBron’s teams get the top seed less often than not, and still find a way. The Toronto Raptors made a valiant run last year, only to fall two games short. And the Washington Wizards and Atlanta Hawks seem eternally content to reach the second round and nothing more. The West doesn’t figure to offer much hope. The Houston Rockets have James Harden, but not enough depth to overthrow the Warriors or probably even the Spurs. The Los Angeles Clippers have an acute case of Washington Wizards-itis. The Utah Jazz are a nice story, but not a championship story. Without making an bold proclamations on who will be the last two teams standing, let’s make some first-round predictions, as the matchups are now set. The Celtics have yet to win a playoff series under Brad Stephens, but I have a feeling that’s about to change this year. It’s been a magical 16-plus years for Boston sports, and even though the Celtics have only chimed in with one title (2008), they are going to be a force to be reckoned with for years to come. The Bulls have always played the Celtics tough, and Boston is the club under more pressure, so it won’t be easy. But the Celts’ depth and ability to pull out close wins will be the difference maker against a Chicago team that lacks enough big-time playmakers. Prediction: Celtics in 6. It’s hard to tell whether the Cavaliers are as vulnerable as they looked over the past couple months, or if this is simply a red herring for a team that knows it is unrivaled by its Eastern Conference foes. LeBron always finds a way to get to the Finals, and it’s not like his supporting cast from last year’s title-winning club went anywhere. The Pacers are a pesky team that, like the Bulls, won’t be a complete pushover. But despite all the struggles and the internal bickering in Cleveland, the Cavs won’t be making a first-round exit in 2017. Prediction: Cavaliers in 6. The Bucks looked like a real threat against a few top teams over the course of the year, but like many other up-and-coming teams, they appear to be a couple years away from contending for anything serious. The Raptors should have some confidence from their strong playoff run of 2016, even though they have some flaws. All eyes will be on whether DeMar DeRozan and Kyle Lowry can elevate their postseason game more than they did a year ago. Prediction: Raptors in 7. The good news is that one of these teams will automatically advance past the first round, but the flip side is that one will add to an ever-growing perception that they are nothing more than a pretender. The Hawks got hot down the stretch, pulling out gutsy wins over top Eastern teams Cleveland and Boston. A potential Boston-Atlanta rematch is on tap, a theme that is mostly sour for Atlanta fans (although the Hawks did beat the Celtics in the playoffs last year). The Wizards make you want to believe that they have turned the corner, but there really isn’t any concrete proof. I’ll go with the hot hand here. Prediction: Hawks in 6. The Warriors’ record wasn’t as good as last year’s record-setting campaign, but don’t let that fool you. They are essentially the same team that now features a healthy Kevin Durant, and that’s very bad news for basically everyone else in the NBA. The Blazers figure to show everyone that they really are a team that was barely good enough to squeak into the field, and will be lucky to get a game in this series. Prediction: Warriors in 4. The Spurs are capable of beating the Warriors, and yet it also feels like they are capable of losing to the Grizzlies. Smart money says that they won’t, because this is as mentally tough of a team as any in basketball. But the Grizzlies won’t go away easy. The good thing for the Spurs is that even if they don’t score a ton, they are plenty comfortable winning games 85-80. That may have to be the case in this series and beyond. Prediction: Spurs in 6. James Harden vs. Russell Westbrook… that is all. Not actually, but pretty close. Harden has a better supporting cast, and ultimately that will be the difference in this series. The Rockets had their way with OKC in the teams’ most recent meeting, and if the game slows down even the slightest bit for Westbrook, it could be a very quick exit for the Thunder. Prediction: Rockets in 5. Sentiment is all with the Jazz here, but is logic, too? Utah took a major step forward this season thanks in large part to Gordon Hayward, and what the Jazz have going for them is that basically all the pressure is on the eternally-disappointing Clippers. The Jazz will need to find a way to steal one of the first two games at Staples Center to realistically have a shot in this series, but if they can, their rabid Salt Lake City crowd could turn the tables in the series. To heck with potential logic, I’m taking sentiment here. Prediction: Jazz in 6. It’s entirely too easy to assume that the world will see a Cavaliers-Warriors matchup in the Finals for a third straight year, so I’m going to mix it up ever so slightly. But is it ever really a stretch to pick a Boston sports team to have major postseason success? Warriors over Celtics in 6. 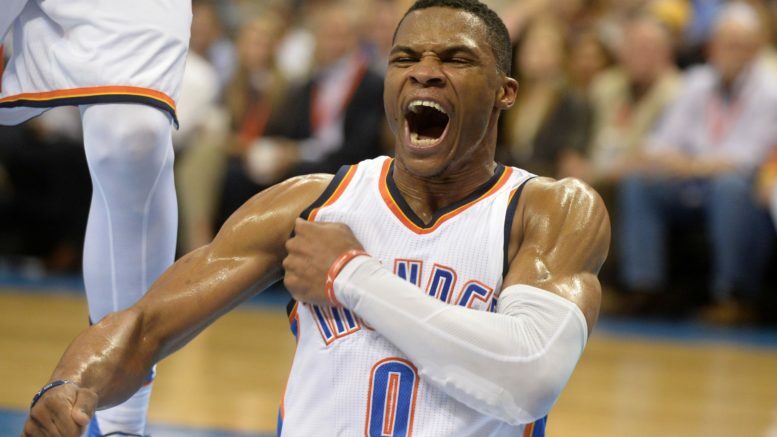 Be the first to comment on "NBA Playoffs Preview: Who Can Shake up the Field?"